This data set provides two data files in text format (.txt). One file contains estimates of above-ground live phytomass for an ephemeral desert steppe located in the Badkhyz Nature Reserve in southern Turkmenistan. Monthly measurements of plant biomass were made by harvest during the growing season (January-May) from 1948 through 1963. Afterwards, an annual measurement of peak live biomass was made in May from 1964 through 1982, with gaps for years 1973-1976. The second file contains monthly and annual climate data recorded at the study site from 1941 through 1982. The study site is one of eight major grassland types of Eurasia which encompass an extremely wide climatic gradient in the direction of increasing maximum summer temperatures and continentality and decreasing precipitation in a north-west to the south-east band of steppes in the European and Asian parts of the former USSR (Commonwealth of Independent States). Badkhyz, on serozem soil, is at the warmer/drier end of the gradient with annual mean maximum/minimum temperatures of 41.5/-15.9 degrees C and annual mean precipitation of 291.9 mm for the period 1941-1982. Above-ground net production (ANPP) for the Badkhyz site is the lowest among the eight Eurasian grassland sites, at 100 g/m2/yr. Below-ground NPP for Badkhyz (1,745 g/m2/yr) was conservatively estimated from a similar dry, semiarid continental steppe in Northern Kazakhstan (i.e., Shortandy). Revision Notes: Only the documentation for this data set has been modified. The data files have been checked for accuracy and are identical to those originally published in 1998. Figure 1. An unusually humid Spring at the Badkhyz grassland site, Turkmenistan. This may happen about once in 10-12 years at Badkhyz, due to cycles of solar activity. 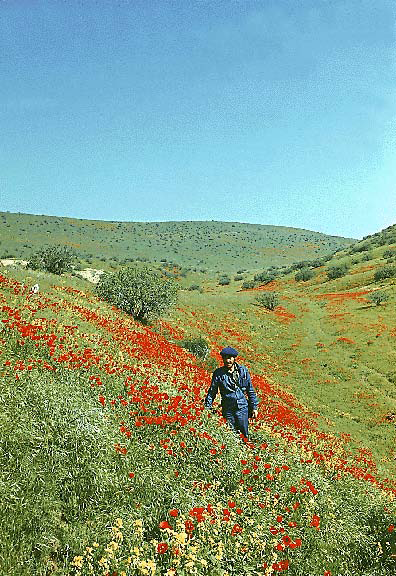 It results in massive blossoming of many species of annual plants; the most characteristic of them are Roemeria and Papaver (poppy) species. In the foreground is Habibulla I. Atamuradov of the Badkhyz Biosphere Reserve and Deputy Minister of Nature Protection for Turkmenistan. Photograph taken late April 1976 by Dr. R. Zlotin, Indiana University, Bloomington, IN, USA). Gilmanov, T.G. 1998. NPP Grassland: Badkhyz, Turkmenistan, 1948-1982. Data set. Available on-line [http://daac.ornl.gov] from Oak Ridge National Laboratory Distributed Active Archive Center, Oak Ridge, Tennessee, U.S.A. Long-term ecological research at grasslands within the former USSR collected a large amount of data on phytomass, productivity and element cycling, together with climatic and soil regimes for various types of grassland ecosystems. These grasslands are found in different natural "continentality" climatic zones in the direction of increasing maximum summer temperatures, decreasing precipitation north-west to the south-east. The grassland types range from the luxuriant highly productive meadow-steppes of Central Russia to the ultra continental steppes of Central Asia and the arid ephemeral grasslands in the Middle-Asian republics of the former USSR. 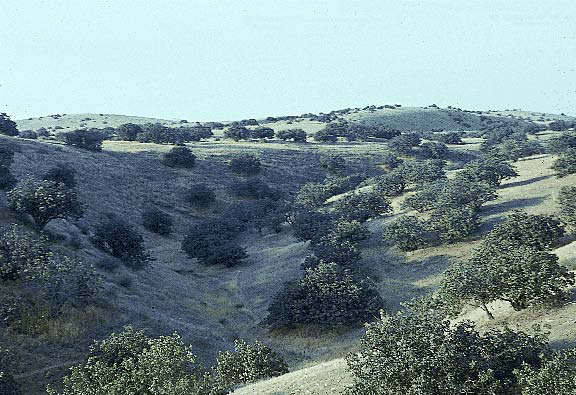 The Badkhyz data set contains biomass measurements that were made in an ephemeral desert grassland steppe at the Badkhyz Nature Reserve Station near Kushka in southern Turkmenistan between 1948 and 1982. Monthly measurements of above-ground live biomass were made during the growing season (January-May) from 1948 through 1964. Afterwards, annual measurements of above-ground peak live biomass was made in May from 1965 through 1982, with gaps for years 1973-1976. Averaged over the time series, above-ground live phytomass, standing dead, and litter biomass were estimated to be 69, 42, and 132 g/m2 (dry matter weight), respectively, while below-ground phytomass was estimated to be 1,180 g/m2 (dry matter weight) (Table 1, Gilmanov et al., 1997). ANPP was estimated to be 100 g/m2/yr and BNPP was estimated conservatively to be 1,745 g/m2/yr based on values for a similar dry, semiarid continental steppe in Northern Kazakhstan (Shortandy) (Table 1, Gilmanov et al., 1997). The Russian approach to estimating annual NPP is based on repeated (usually 2-weekly) sampling of live, standing dead, and litter fractions of phytomass during the growing season. This method gives estimates of annual NPP that are 1.6 to 2.0 times higher than the seasonal maximum of standing live phytomass. ANPP and BNPP values for Badkhyz agree with those of Olson et al. (2013a, b) and Scurlock and Olson (2013) when converted to grams of carbon per meter square per year using conversion factors of 0.5 for above-ground grasses and 0.45 for below-ground roots. Figure 2. General view in dry season of a woody savanna ecosystem, near the Badkhyz grassland site, Turkmenistan. Note the pistachio bushes (Pistacia vera) with the graminoids Poa bulbosa and Carex humilis in the open areas. (Photograph taken November 1979 by Dr. R. Zlotin, Indiana University, Bloomington, IN, USA). Five month growing season (Jan-May) 1948-1964. Annual May estimate 1965-1982 with gaps for years 1973-1976.
bdk_npp.txt 1948/01/15-1982/05/01 Above-ground biomass for a desert steppe at Badkhyz, Turkmenistan. NPP Data. The data file is text format (.txt). The first 18 lines are metadata; data records begin on line 19. The variable values are delimited by semicolons. There are no missing values. Biomass units are expressed in g/m2 (dry matter weight). Long-term ecological research under the International Biological Program (IBP) and several other programs at research stations in the Commonwealth of Independent States (former USSR) collected a large amount of data on phytomass, productivity and element cycling, together with climatic and soil regimes for various types of grassland ecosystems. These data provided a unique opportunity to assess the performance of the CENTURY ecosystem model across a wide environmental gradient from the luxuriant highly productive meadow-steppes of Central Russia to the ultracontinental steppes of Central Asia and the arid ephemeral grasslands in the Middle-Asian republics of the former USSR. Long-term phytomass data from Badkhyz, representing the latter of these ecotypes and the most extreme environmental conditions, was used along with other sites to validate CENTURY and test the model's robustness. 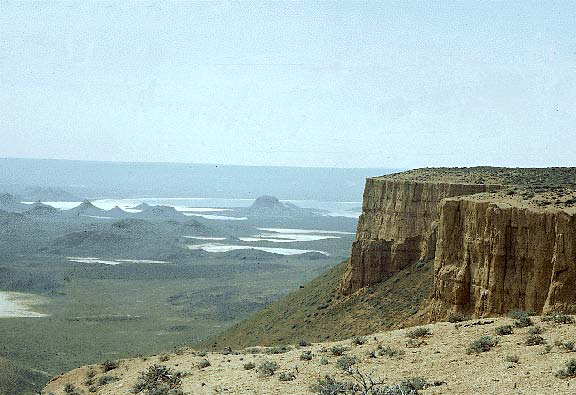 The physico-geographical conditions and bionomical properties of the desert grassland ephemeretum of the Badkhyz site are appreciably different from the classic steppes and prairies, thus making this site an important test bed to determine the limits of applicability of the CENTURY model. The time series of observations at the Badkhyz site is sufficiently long, encompassing 30 years (1948-1972, 1977-1982) with high variability of weather regimes between 1941 and 1982 -- from the most unfavorable year 1946 to the most favorable year 1982. The distinguishing features of the climate of this serozem desert grassland ephemeretum include (1) an early and short growing season (February to April/May), (2) a considerable but irregular role of spring ephemerals in the phytomass production of the community, and (3) the ephemeral-like (= ephemeroidal) phenology of principal perennial species, such as dominants Poa bulbosa and Carex pachystylis. In view of these conditions, the agreement between the field data and the model is not bad even in this extreme case (Gilmanov et al., 1997). The mean absolute deviation between the data and model was found to be Dabs = 38.6 g/m2 (22.5% of Gmax). The general pattern of the year-to-year dynamics of the phytomass, expressed by the correspondence of the field (empirical) and model maxima, is represented by the model rather reasonably. Net primary production of grasslands is subject to a number of different methods of estimation from biomass data, some of which may be inappropriate for particular biome types. Methodology of estimation/calculation needs to be taken into account, as well as methodology of measurement, when making comparisons between different regions. Errors in biomass measurement may also occur between different study sites. For short time series of data it may be assumed that measurement methodology remains consistent; however, over very long time series changes in staff, tools, etc. may lead to "calibration" errors. Badkhyz study site in southern Turkmenistan is typical of the emphemeroidal ecosystems found on the serozem soils in the foothills of the mountains of Middle Asia. The climate of the region is characterized by the marked seasonality of precipitation, which occurs only in winter/early spring, giving an early and short growing season, followed by prolonged drought from May to October. Badkhyz is at the warmer/drier end of the Gilmanov et al. (1997) continental climatogical gradient with annual mean maximum/minimum temperatures of 41.5/-15.9 degrees C and annual mean precipitation of 291.9 mm for the period 1941-1982. Additional long-term observations on climate, soils and productivity of the Badkhyz ecosystem have been published by Nechaeva et al. (1971), Artykov (1975), and Kamelin and Rodin (1989). Badkhyz represents the ephemero-ephemeroidal desert grasslands on the serozem soils of the foothills of the mountains of the Middle-Asian Republics of the former USSR. This desert grassland type is also known as the ephemeretum ecosystems. The soils belong to the serozem type with light loam or sandy texture, high carbonate content, and poor in humus and mineral elements for plant nutrition. The species richness of the plant community amounts to 64 vascular species, with predominance of Poa bulbosa, Carex pachystylis, Onobrychis pulchella, and several desert annuals. The time series of observations at the Badkhyz site is sufficiently long, encompassing 30 years (1948- 1972, 1977-1982) with high variability of weather regimes - from the most unfavorable year 1948 to the most favorable year 1978. The distinguishing features of the climate of the serozem desert grassland ephemeretum include (i) an early and short growing season (February to April/May), (ii) a considerable but irregular role of spring ephemerals in the phytomass production of the community, and (iii) the ephemeral-like (= ephemeroidal) phenology of principal perennial species, such as dominants Poa bulbosa and Carex pachystylis. Figure 3. View from the Badkhyz grassland site, Turkmenistan, towards the Eroyulanduz Depression (remnants of ancient volcanoes and different types of desert ecosystems can be seen. (Photograph taken October 1975 by Dr. R. Zlotin, Indiana University, Bloomington, IN, USA). Long-term observations on climate, soils and productivity of the ephemeretum grassland ecosystem of the Bakhyyz Natural Reserve are reported by Nechaeva et al. (1971), Artykov (1975), and Kamelin and Rodin (1989) (in Russian). Methodological aspects of field experimental studies are summarized by Titlyanova (1988) (in Russian). The methods of field measurements of above- and below-ground biomass are based on harvest techniques and, with respect to sampling area, replication, etc., are very close to the methods used by western ecologists during the IBP studies (e.g., Milner and Hughes, 1968; Sims and Coupland, 1979). The Russian approach to estimating annual production of grassland plant communities (with subdivision on above- and below-ground components) is based on repeated (usually 2-weekly) sampling live, standing dead, and litter fractions of phytomass during the growing season. This method of calculation gives estimates of annual production that are 1.6 to 2.0 times higher than the seasonal maximum of the standing crop of the corresponding phytomass fraction (Titlyanova, 1988). This data set is part of a series of grassland data sets assembled and checked by Dr. Tagir Gilmanov (Gilmanov et al., 1997) from primary sources originally reported [in Russian] in Nechaeva et al. (1971), Artykov (1975), and Kamelin and Rodin (1989). Figure 4. 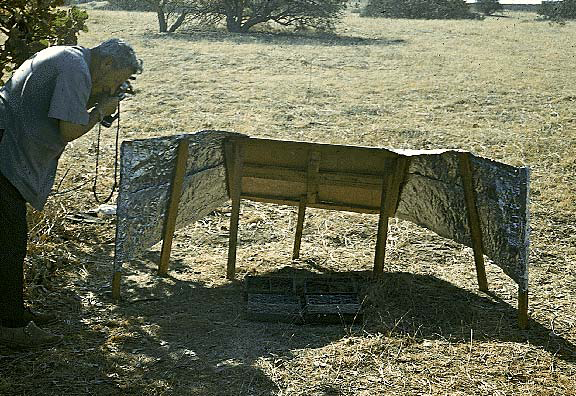 Experiment to study the effect of UV-b solar radiation on litter decomposition at the Badkhyz grassland site, Turkmenistan.(Prof. Leonid Rodin, Komarov Botanical Institute, Leningrad, is photographing litter samples under a shade screen. Experiments at Badkhyz and elsewhere demonstrated considerable influence of solar radiation on decomposition rate. (Photograph taken October 1978 by Dr. R. Zlotin, Indiana University, Bloomington, IN, USA). Figure 5. Digging a soil pit at the Badkhyz grassland site, Turkmenistan. 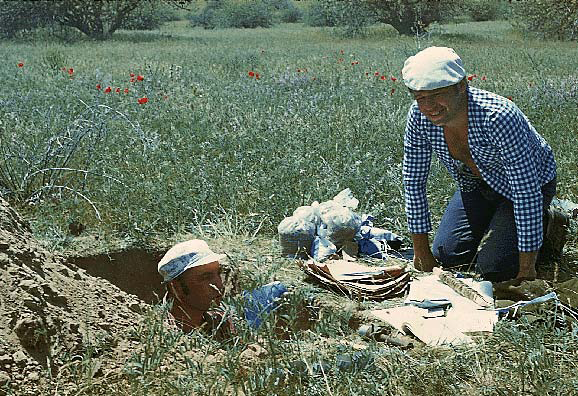 Roman Zlotin (in the pit) and Gennady Domnikov - professor and graduate student, Institute of Geography, USSR Academy of Science - are taking soil samples to 1.5 m depth for study of the amount of nutrients, root biomass, microbial activity, density of nematodes, and soil microarthropods. (Photograph taken May 1978). Artykov, K. 1975. Agroclimatic foundations of the phytomeliorative works in the foothills of Turkmenistan. Ashkhabad, 101 pp. (in Russian). Kamelin R.V., and L.E. Rodin, eds. 1989. Pistacea woodlands of Badkhyz. Nauka, Leningrad. 246 pp. (in Russian). Nechaeva N.T., S.Ya. Prikhod'ko, and K.F. Shuravin. 1971. Harvest formation on the Poa-Carex pastures of the foothills of Central Asia in relation to meteorological conditions (as exemplified by Badkhyz, Turkmenian Republic). In: Biokompleksy pustyn' i povyshenie ikh produktivnosti. Ylym, Ashkhabad. p. 71-113. (in Russian). Sims, P.L. and R.T. Coupland. 1979. Producers. pp. 49-72. In: R.T. Coupland (ed.). Grassland ecosystems of the world: analysis of grassland and their uses. Cambridge University Press. Titlyanova, A.A. 1988. Methodology and methods of studying of the production-destruction processes in herbaceous ecosystems. pp. 3-10. IN: Ilyin, V.B. (ed.). Biologicheskaya produktivnost' travyanykh ecosistem [Biological productivity of herbaceous ecosystems]. Nauka, Novosibirsk. (in Russian).